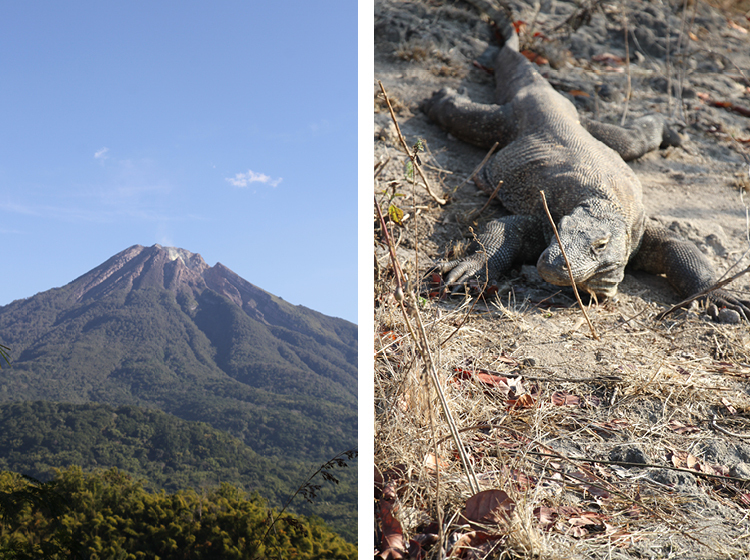 Ok, I know, technically there aren’t any dragons on the island of Flores itself but I promise, more of the big scaly fellows later. The land mass is impressive is comparatively large and extremely mountainous, about 340 km east to west as the crow flies but, for those travelling overland, it’s best to remember that you are not crows! Flores is situated smack bang in the middle of the ‘ring of fire’ and is often prone to volcanic eruptions, tsunamis and earthquakes but please don’t let that put you off. The island is blessed with areas of stunning natural beauty that run to white sandy beaches, deserted islands, terraced rice fields, thick rain forests and an impressive array of volcanoes, of which fourteen are still active. Ende itself is a mish-mash of government buildings and a plethora of shops selling,…not very much really so it was good to leave it behind and head for the first of the destinations, the extinct Mt Kelimutu with its famed three ever changing coloured crater lakes. To reach this frisky young volcanic mountain entails travelling along a dirt road which winds in a series of hairpin bends that rise ever higher to the small hamlet of Moni which clings, limpet-like to the side of the volcano itself. Accommodation here is, at best basic and between June - September rather scarce, meaning I ended up sharing a room with three others in a modest guest –house painted bright luminous green. If you are after rain head showers and fluffy white robes you are out of luck as you won't find them here. Apparently, the best time to see the crater lakes is at sunrise and so a 4 am start was the order of the day. The good thing for me was that a road of sorts exists that takes the traveller 90% of the way up the steep sides of the mountain. Then it’s just a case of traversing the 1000 or so steps carved into the rock following the torchlight to the summit. Being a touch unfit I was the last of our small group (by a long way) to reach the top which by the time I reached it, seemed to be populated mainly by vendors supplying hot chocolate, tea and coffee to ward off the freezing winds and extremely low temperatures. The early morning sun was trying desperately to penetrate the clouds that were rolling in like an invading army and so we had but a brief glimpse of the coloured lakes (blue, green and brown) before all the early risers were enveloped in a thick mist that reduced visibility to about 3 ft! In hindsight, I should have stayed in bed! The misty morn over I headed back down to sea level to a pebble beach that is made up entirely of blue coloured stones. These are piled high by the locals, sorted by size and shipped to Bali and beyond where I was told they are used as floor coverings for showers of elegant villas and hotels. The unique feature of these stones is that when wet, the pale blue colour instantly changes to emerald green…. strange but true! From there it was on to the village of Bena, which once again involved a tortuous climb into the mountains. This pristine settlement of the Ngada people is a bit like stepping back in time with its eye-catching stone shrines and megalithic formations coupled with rich ceremonial lives where ancient belief systems co-exist with latter-day Catholic doctrines. What makes this society different from the rest of Flores is that it is a matrilineal culture whereby the Negara people determine their heirlooms through their maternal lines. Back down to sea level and the village of Aimere where it seems the entire population is involved in the distilling of arak. A brief stop at the roadside lean-to where I was introduced to how this firewater is distilled. I have to say, a couple of shots of the 76% proof clear liquid really does tend to put a nice rosy glow on the afternoon. A night’s stay in the mid-sized town of Ruteng and I check into one of the numerous homestays only this one had the unusual name of Edelweiss, no doubt inspired by its elevated setting, and steeply pitched room as if they were expecting snow (or perhaps named by some intrepid Swiss missionary) The following morning I am finally ready to take to the waters and head for the home of the dragons. At this point I have to say that in the east of Flores accommodation is all rather basic and is technically backpacker style or homestay so don’t expect too many internationally renowned resorts to rest your weary bones after a long days drive. The other thing to note is at present the entire road network between Ende in the east and Luang Bajo in the west is currently undergoing a huge upgrade. It would appear that half the population of the island is involved in the construction with villagers breaking and carrying rocks and gravel hither and thither. I mentioned as the crow flies earlier, well at sea level these roads twist and turn and then make their way ever upwards around the soaring peaks where one is confronted with vertiginous drops of up to 1000ft to the valleys far below. The port city of Luang Bajo is the departure point to the Komodo National Park and the oversized lizards (see I didn’t forget!) Slowly but surely the landscape begins to change and the thick jungle of the east recedes to be replaced by almost Savannah like terrain; it’s definitely drier and less lush on this west side of the island. Before the final descent to the port, the twisting road skirts a vast valley, home to the famous ‘spider web’ rice terraces. The hike to the top of the surrounding hills is well worth it as the shape of the field is clearly visible – which looks a little like an oversized collapsed umbrella. This unusual configuration is known as moso, based on an elaborate system whereby each family in the village is allocated a certain portion of the land, working from the centre of a huge circle outwards. The structure is so perfectly symmetrical that it is a mystery as to how the original layout was conceived and constructed. The bustling port city of Luan Bajo is charming, even though it's rather seedy and run down. Waterfront buildings have the feel of a pirate town with dock- workers sitting around chatting, smoking and picking at their beetle nut stained teeth. The bay itself is like a scene out of Peter Pan’s “ Never Never Land” complete with an eclectic array of large and small sailing vessels, bobbing at anchor like horses in harness and beyond, across the azure blue waters, scores of small islands dot the horizon. My guide whispered conspiratorially that one of the larger luxury yachts at anchor had recently sailed with Tony Blair on board accompanied by Gwyneth Paltrow He, no doubt taking a well-earned break or hiding from dealing with détente in the Middle East, and she, well…. who knows? My craft was at least seaworthy but basic in the extreme. However, once port was behind us the calm seas and playful dolphins more than made up for any discomfort. The crew of three, plus faithful guide made sure I was comfortable and very well fed. Once I had been introduced to a local park ranger we took the 3km hike into the island’s interior through the rolling hills. It wasn’t too long before we came across one of the mythical creatures in the scrubby forest. The Komodo dragon (Varanus komodoensis) is the world’s largest and oldest living monitor lizard with adults reaching lengths of three meters and sometimes weighing up to 120kg. Our first encounter was with a female who was in the process of digging a large pit into which she would eventually lay her eggs. This is not really a creature that one would want to confront as, although they have the capacity of looking slightly inert they can easily accelerate up to 18km at full pace. The giant tail, when used as a weapon can bring down fully- grown buffalo or horses and the claws look as if they could rip through concrete. They salivate constantly and this dribble is part of their unique hunting arsenal for, if the unfortunate prey does happen to escape the lizard's clutches, the bacteria and anti-coagulate in the saliva will ensure that the wounded animal will eventually bleed to death. They are loners (being that ugly I was not surprised) living solitarily except during the mating season. The eggs hatch after nine months and the small hatchlings will head for the trees to spend the next two years hiding from the larger lizards that treat their baby cousins as a tasty snack. Rinca is a wonderful experience with well-defined walking trails that are not too taxing and take one high enough to afford expansive views of the bays and the surrounding countryside. On to Komodo which involved a ‘night sail’ through waters that swirled and formed mini whirlpools due to the treacherous currents for which these straits are renowned, however, our illustrious skipper was more than up to the task. I awoke the following morning in a crystal clear bay replete with beaches, pink in colour. I went ashore on to an island that I had read about since I was a boy. It turned out to be a huge disappointment. The main National Park camp of Komodo Island is a collection of dilapidated buildings with local vendors selling all manner of things dragon from teeth to rather elaborate carvings. Cruise ships now visit this island…. that’s right, cruise ships!! Perhaps I shouldn’t be so negative as, why shouldn’t the overweight and the infirm have a chance to see the dragons as well. Special paths that are flat and paved have been constructed to accommodate those on little motor scooters, allowing the morbidly obese to get up close and personal with the lizards who lie around the main encampment soaking up the sun. After two days puttering around the waters of the national park and snorkelling in the impossibly clear, blue waters it was time to leave this paradise and head back to Luang Bajo. A beachside resort provided a jaw-dropping sunset: a fitting end to another splendid adventure. Flores, it’s a surprise at every hairpin turn but, as they say, if you don’t go, you’ll never know. Paul v Walters is the international best selling author of a number of novels and short stories and when not cocooned in sloth and procrastination in his house in Bali he scribbles for several travel and vox pop journals.